Pick you up at your hotel and drive Cu Chi District to visit the Cu Chi Tunnels 70 kilometers North West of down town Ho Chi Minh City. The Cu Chi Tunnel system had been created long time back, from 1948 to assist Viet Minh in the combat with French. And it was continuing built over 25 years later. It was an underground city with living areas, kitchens, storage, weapons factories, field hospitals, command centers. During the American War the entire area of Cu Chi was designated a free fire zone and was heavily bombarded. From 1988, two sections of tunnels have been open for visitors. between Cu Chi and My Tho, we reach to Mekong Delta with a lunch first. On arrival, visiting Cao Dai temple, a special religion of Vietnam, then embarking a private boat to see a country life in Mekong. Then continue cruising along small creek to Mekong River estuary, to Con Phung (Phoenix Island). 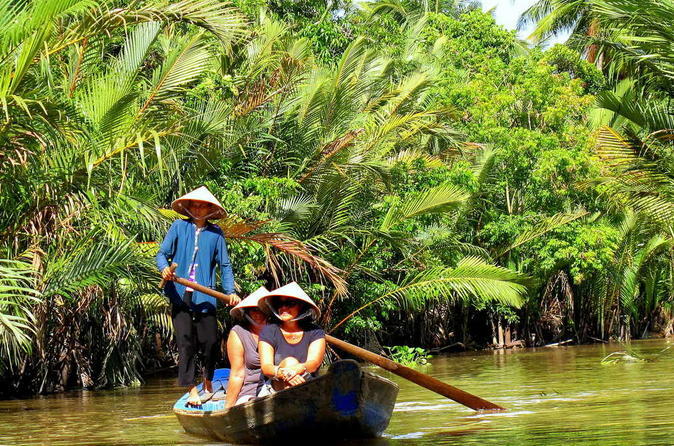 The motorized boat cruise more along natural creeks and quiet village in Ben Tre Province, visit orchards, bee - keeping farm, taste natural honey and honey wine, enjoy tropical fruit, traditional music, see round a distillery, explore the local coconut candy production process, taste candy & coconut pulp. Arrival at your hotel in the late afternoon. - Lunch (no drinks on meal), mineral water on tour.